This is the worst of the images. Newer leaves appear a bit better. I"ve been giving the tree "super citrus" food or similar, some slow release little hundreds and thousands type things, seasol and aquasol. I also did a lot of what I now think was unnecessary adding to the soil before planting, blood & bone, better soil, compost & gypsum. So it"s hard to believe it could be N deficiency even though that"s what to my inexperienced eye it looks like. I wondered about the pH, found one very superficial sample close to the trunk to be 5.5. I"m guessing that"s fertiliser not properly watered in. Another just slightly [less than 1cm deep] deeper sample 30 or so cm away came in at 6.5. Should be 6.5-6.8. The soil was a little bit dry and felt compacted [too much gypsum? Had been a bit clumped and clayey; also added heaps of organic matter]. So gave a rather heavy watering to try to dissolve away any excess surface food. Drainage good. Tree about 1.3m tall w 4 lemons 6cm long. What to do? 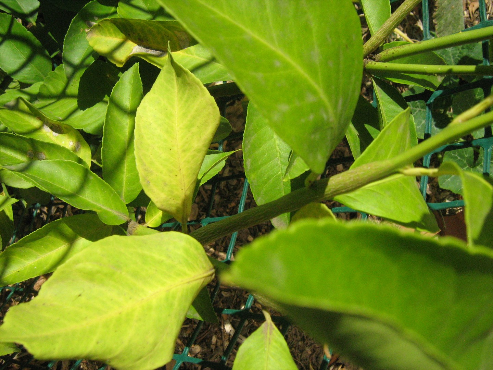 I am hoping some one can advise on the problme I am having with my lemon trees... I have 2 trees in my garden, both are about 8 Ft Tall...very healthy foliage..green and grows well..however it has not flowered at all in the past 12 months...We moved into the house an year ago...and I suspect it never flowered....and I see no sign of flowering...what am I doing wrong ? I have fertlised it, I have watered it as per advise...once or twice a week, I have trimmed it iast winter...no luck ....Any advise ? thanks Sue. the privet is history and my side of the fence is finally getting half a chance at life. i"ve transplanted teh abovementioned lemon, a eureka, to another bed where i"ll espalier it. it never did thrive. it got asttacked by Citrus gsll wasp and something kept eating the new shoots. in its place is a new lisbon which is doing much better. re: iron i"ve been burying old bits of iron pipe, nails and miscellaneous rusty edging stuff for months there. even an old pair of hedge clippers sans handles; al;most unrecognisable now. teh soil is much better now in that bed. i"m optimistic. agree with you; iron was the problem.